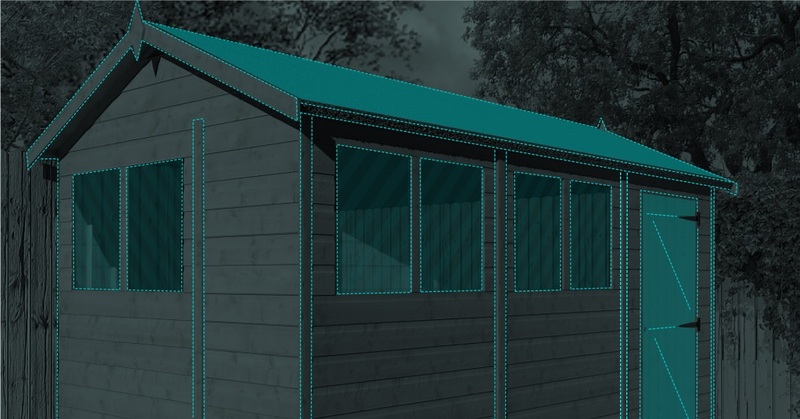 Our latest creation of Rainbow Garden Buildings™ was established by the DSB group to supply and distribute a complete range of timber garden buildings to a wide cross section of customers from the most comprehensive manufacturer in the UK. Rainbow Garden Buildings is conscious of its responsibility in striving to ensure that materials are sourced from properly managed and sustainable forest resources and follows a program of monitoring and assessing its suppliers. The DSB group has a role of promoting environmentally friendly, sustainable grown timber products. We develop and promote the use of Swedish and Norwegian timbers sourced from FSC and PEFC certificated grown woodlands across Europe, we also acknowledge the support we can give right here in the UK by reducing our carbon footprint. This is achieved by the way we heat our factory and also operate the latest euro certified vehicles reducing the everyday global impact. other accessories like fire pits or barbecues. Colour choices, for guide purposes only! Rainbow Garden Buildings is conscious of its responsibility in striving to ensure that materials are sourced from properly managed and sustainable forest resources and follows a program of monitoring and assessing its suppliers. The DSB group as a role of promoting environmentally friendly, sustainable grown timber products. We develop and promote the use of Scandinavian timbers sourced from FSC and PEFC certificated grown woodlands across Europe, we also acknowledge the support we can give right here in the UK by reducing our carbon footprint. This is achieved by the way we heat our factory and also operate the latest euro certified vehicles reducing the everyday global impact.